What are the Average Electricity Rates by State in Australia? Compare Your Electricity Rate with the Average in Your State. Comparing the range of energy prices available in your area will help you to find out if you’re paying too much for your electricity and gas. Compare and switch to a more affordable energy price with help from Electricity Wizard. Electricity rates by state can vary dramatically, depending on where you live in Australia. Different distribution networks and regulation means electricity and gas varies state by state. If you want to cut to the chase and find cheaper electricity rates today, you have a great chance to do so right now when you use our helpful, accurate electricity comparison service to get the job done. Electricity Wizard has already helped over 1 million Australians compare and switch. Many have made big savings by making the switch to a cheaper electricity and gas retailer. In just 5 minutes, you too can receive an absolutely free quote to find more affordable electricity rates by state and start saving a bundle on annual energy expenses. To make the switch and see how much you could save today, simply call 1300 557 701 or fill in the form below for more information! Energy prices have increased significantly in the period between July 2017 and January 2018. However, over the past few years, electricity prices across Australia have been up and down. Increased competition has the power to see the cost of electricity drop. 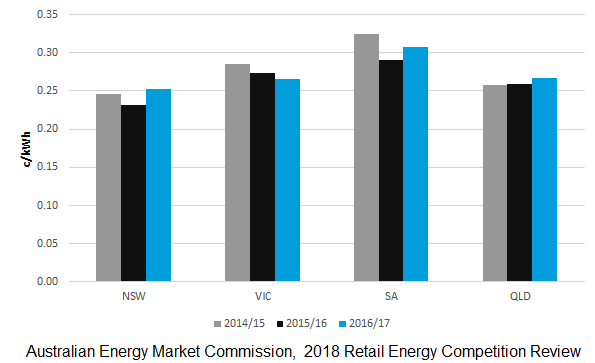 While the standing offer rate might increase, market analysts are forecasting an overall reduction in electricity prices between 2018 and 2020 for those that take advantage of discounted market offers. But consumers need to take the first step! Using Electricity Wizard‘s fast comparison service and comparing retail prices every 12 months will make sure you get the best price. According to the Australian Energy Market Commission, there’s a range of reasons why the price of electricity fluctuates. These include changes in the cost of fuel such as coal and hydro power, changing business activity, investor confidence, changes in the weather, global financial markets, and consumer choices. Consumers have the power to influence the price of electricity and gas simply by the choices they make when selecting an electricity supplier. Demanding competitive rates and finding the best deal with guaranteed low kilowatt per hour costs is one way households can make sure they pay the lowest possible price for their power. If you want to find cheaper electricity rates by state in Australia, the first and most important step you can take is to choose a local electricity supplier with lower rates. While you may save just a few cents an hour on electricity, it will quickly add up and could result in a substantial figure by the end of each year! It also means retailers will be quick to offer bigger incentives and lower rates across the board. Tariffs/Rates: Your energy bill will be calculated based on several distinct factors, including regulated market charges, distribution charges, supply charges, GST, and the cost of energy that is used. When you use the Electricity Wizard comparison service, we will examine all of the factors above and compare apples with apples to help you find you a more affordable retailer today. Customer Service: Even when switching electricity retailers, it’s still important to look for a company that will provide you with excellent support and top-notch customer service. Our electricity comparison service will help you to locate a new retailer that is fast, reliable, and helpful in the event of an emergency. Payment Plans: Each electricity retailer will provide a unique payment plan and may offer discounts for paying early or on time. Use the Electricity Wizard comparison service to find a great electricity retailer that meets your needs based on your preferred payment schedule! How Much Can You Save by Switching Electricity Supplier? The average yearly cost of electricity varies throughout Australia. The AEMC’s 2018 Retail Energy Competition Review found that there are huge savings on offer to those consumers that are willing to find the best local deal and switch providers. $273 in the Australian Capital Territory. $31 in South East Queensland. To get great savings on your power bill, all you have to do is phone Electricity Wizard! Compare and You Too Could Save Today! It’s never been easier to compare energy providers than with Electricity Wizard. Call now on 1300 359 779 and speak to an energy specialist who will help you find a better deal to meet your needs.